Without support from our local community, our House wouldn’t have the ability to help so many families in need. In fact, 79 percent of our House’s annual funding comes from the Greater Lansing community. If you’re in the Capital region, consider making a charitable contribution to the Ronald McDonald House of Mid-Michigan. Your generous contributions will help us take care of parents, siblings and ill children for years to come. The quickest and simplest way to support the Ronald McDonald House of Mid-Michigan is through an outright cash contribution. For an accessible version of our donation form, please contact us at 517-485-9303 or through our contact form. Outstanding charitable tax benefits are just one reason to give a gift of appreciated securities, such as stock. 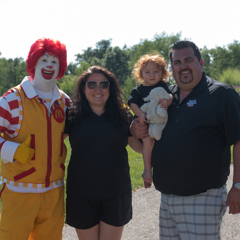 A legacy or lifetime gift is the ultimate symbol and celebration of shared values with the mission of the Ronald McDonald House of Mid-Michigan. Contact us to learn more about our planned giving opportunities. Seventy-nine percent of our House’s annual funding comes from our local community. That means we rely on our community to help keep the doors of our House open. Whether you’re able to donate volunteers, in-kind goods/services, monetary donations, become an event sponsor or a combination of these opportunities, we are able to customize a partnership that works for your organization. Want to learn more? Please contact us.